THE MONK strives to be a horror film with class, style, and substance. It is a classic story of a good man, Father Ambrosio (Vincent Cassell). Orphaned and left to be raised in a monastery as a baby, the Father has grown into a man whose piety and hubris make him ripe for being led astray by the forces of evil. Said forces are exemplified by the disfigured Valerio, a young monk who, as it turns out, is neither disfigured nor a man. Beneath the expressionless mask Valerio wears in the monastery by day is a woman named Matilda (Déborah François) who has the power to soothe the sudden headaches that beset Father Ambrosio. As she eases the Father's pain, she also uses her abilities to get closer to him with decidedly ungodly intentions. Meanwhile the virtuous Antonia (Joséphine Japy) seems to have found true love with Lorenzo (Frédéric Noaille). The only problem is the two are from different classes, but perhaps true love really can conquer all. The stories converge when Antonia hears Father Ambrosio give a sermon and finds herself greatly moved by his words. When her mother falls ill, she calls upon the Father to come and visit, setting in motion Matilda's final plan to bring the man of God to ruin and damnation. The themes are not unlike those found in some of the Marquis de Sade's works, showing how the outwardly virtuous can be led astray. The problem is that the characters in THE MONK are little more than archetypes; Not a one is written like a genuine human being, not even a little bit, and even an actor as fine as Cassell winds up coming across fairly bland. That makes it difficult to invest emotionally in anyone or care whether they ultimately find redemption or not. And since, as was mentioned at the start of this review, this film is going for class, we don't even get much sizzle from the depictions of sin to keep our interest. Even so director Dominik Moll conjures up some satisfying visuals and manages to keep us interested in the plot. 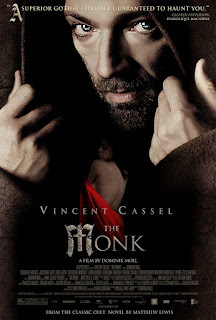 Sadly, the rewards for sticking with THE MONK are slim as the film reaches its inconclusive and unsatisfying end. 2 ½ out of 4 stars.